A student teaching intern mentors a student during a lesson focused on literacy in Pekin. While other college students “recharged” during Thanksgiving break, 19 Illinois State elementary education majors took part in parent-teacher conferences. Instead of bemoaning their schedules, these students embraced the opportunity. “We recognized how important it was for us to understand how these conferences work. I wasn’t thinking about missing part of the break; I was excited to meet my students’ parents and to see how my cooperating teacher would handle it,” said Janelle Ricketts ’17. 32 weeks, twice as long as traditional student teaching. The students experience almost everything a first-year teacher does: staff meetings, state testing, workshops, committees, and volunteer activities. 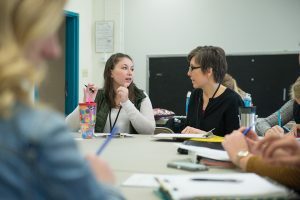 In the fall, they are in a P–12 classroom from 8 a.m. until 4 p.m. Thursdays and Fridays are earmarked for methods courses (focused on developing practices) taught by Illinois State faculty. That course work takes place in one of their district’s buildings. In the spring, the interns continue to be supported by their cooperating teachers, but they become the primary curriculum decision-makers in the classroom. “When I got the chance to host my own parent-teacher conferences in the spring, I really felt as though they viewed me as someone who was just as invested in their child’s success as my cooperating teacher was,” Ricketts said. She was among the interns placed in the Pekin School District, one of the University’s 23 partners across the state. More than half of all eligible early childhood, elementary, middle level, and bilingual-bicultural elementary education majors participate in yearlong internships. The PDS movement grew out of John Goodlad and Linda Darling-Hammond’s research; they encouraged universities to partner more closely with P–12 schools. The endgame was to deliver authentic professional experiences and bolster candidates’ readiness before their first year of teaching. While the model is not new, Illinois State was an early adopter. In 1994, the University’s PDS partnership with the Wheeling Community Consolidated School District became the first of its kind in Illinois, and one of the first in the United States. works with interns in Pekin. “The University and district’s leadership quickly recognized the value this partnership could provide. Our faculty were invigorated and refreshed by working with school partners. Wheeling’s superintendent appreciated that his P–12 students and teachers could benefit from additional resources through our interns and faculty,” said Sally Pancrazio, ’60, M.S. ’66, retired dean of the College of Education. the role, served as Wheeling’s first onsite supervisor for Illinois State’s interns. Among those first alumni, a high percentage became leaders in the field, from curriculum coordinators to principals. One of them was 2016 California Teacher of the Year Amy Laughlin ’98. “Without question, my PDS experience set me up for success,” said Laughlin, who now serves as a principal for Lee Elementary in Los Alamitos, California. PDS interns spend their first eight weeks in the same classroom they will take over for the entire spring semester. During this time, they collaborate with their cooperating teacher to assess students and set up classroom expectations. Over the next eight weeks, interns are placed in a diverse setting, usually at another school within the district. This could also mean working with students of different ages or those requiring different levels of support. Their opportunity to learn from mistakes and work with a wide range of populations is a boon to their confidence and competence. “Many of our interns are so solid in their classroom routines that it feels like you’re walking into a veteran teacher’s classroom,” said Jenny Garcia-Macko, principal at Central Roads Elementary School in Rolling Meadows. From their first days as new interns, Redbirds are treated like colleagues. “The first time we came to a staff meeting, the principal and vice principal introduced us; it was a very welcoming experience. I could tell then that it was going to be a great place for me to grow and see change in myself,” said Fatima Cisneros ’17, a former bilingual/bicultural elementary education intern in the Elgin School District. Long before they begin their PDS internships, Redbirds are interviewed and matched with a cooperating teacher, explained current Wheeling PDS supervisor Catherine Joy. Like any partnership, there is a feeling-out period. “Our relationship has evolved so much since our first meeting,” Cisneros said. “He doesn’t see me as a helper or an aide, he sees me as a fellow teacher, a colleague, just as I see him as a colleague of mine. Redbirds, like practicing teachers, are evaluated on the Charlotte Danielson Framework for Teaching. Joy’s cooperating teachers tell her that they benefit from looking at the rubric with fresh eyes. Collaboration does not start and end with the cooperating teacher. Joy explained that it is common for interns to co-plan and co-teach with several teachers, including special education teachers. “Interns are not sheltered; they become part of the entire school community,” she said. No matter how intense the experience becomes, Redbirds know that their supervisor or cooperating teacher is never more than a phone call—or text—away. In addition, the program’s cohort model provides built-in support amongst the aspiring teachers. “If I need anything, I know that I can go to any of the other 17 interns and they would be willing to help me,” Cisneros said. When interviewing for teaching positions, PDS interns are in demand and are sometimes mistaken for second-year teachers. Garcia-Macko said that while traditional student teachers often rely on observations from their cooperating teachers, PDS interns have the firsthand experiences of talking to hiring administrators about their own practices. After more than 20 years of refining the program, it is no wonder PDS interns’ resumes continue to rise to the top of the pile across Illinois and the U.S.